I’m a huge fan of mayonnaise and if you’ve ever wondered how to make mayonnaise at home today I’m going to show you just how easy it is. This recipe I came up with last year is a Garlic Basil Mayonnaise. It’s tangy and rich plus you can taste the herbs which is what you want. I like to add it to my favourite salads, sandwiches or use as a dip. Nicola’s Potato Croquettes stuffed with Bacon and Cheese for example would pair well with this Basil Garlic Mayonnaise. You just have to use your imagination because no one likes to eat the same foods all the time. Spices and sauces really make a big difference to the foods we eat. Every year I plant a load of basil in our back garden. I use bucket containers and start them with about 4-6 packets of seeds. I water the pots just about every day and never let them get dry otherwise the basil leaves aren’t as large and full. The 4 to 6 packets amounts to lots and lots of basil and although the first year I wasn’t sure what I was going to do with all the extra basil I soon came up with a few ideas. One idea was to create basil garlic cubes but I decided to use a muffin tin instead of ice-cube trays. The results were amazing and now every winter we have fresh herbs packed into what I call the basil garlic puck tucked away in our freezer. I wasn’t sure if I was going to like the Basil Garlic Mayonnaise but I thought I would give it a try. When I don’t make mayonnaise I typically wait until Hellman’s Olive Oil Mayonnaise goes on sale for $2.99 which I think is a great price. You can pay up to $5.99 for a 1L jar of mayonnaise if you want the next best thing to homemade. Ingredients in mayo differ depending on what you want the mayonnaise to taste like at the end but the process is the same every time. The flavours you add is what makes it unique. I used an extra virgin olive oil for this recipe however if you are not keen on a stronger olive oil taste you can substitute with vegetable oil, a light olive oil or another oil you fancy. I decided to blanch the basil leaves by the third batch because it helps to keep that beautiful green colour the same as it would if you were to blanch any other green leafy vegetables. Quickly after about 20 seconds or so transfer the basil to an ice-cube bath to stop the cooking process. The result is vibrant green leaves. The garlic in this recipe is actually garlic scapes believe it or not. Garlic scapes are the “Flower Stocks” of the garlic. You want to eat them when they are tender because the longer you wait to harvest them the harder they get. They really pack a punch with flavour and certainly should not be wasted. My father-in-law is a garlic fanatic and grows quite a bit in his organic garden. When the garlic scapes came up last year he gave us bags full. I donated some free to anyone who was interested but for us I made garlic infused olive oil. I also went ahead and tried my hand at a garlic scape butter which was delicious on toast. I washed and chopped the fresh garlic scapes and added them to extra virgin olive oil. I let it sit for a couple of days to let it infuse the oil better. I use the entire 1/2 cup with the oil in this recipe. If you don’t have garlic scapes you can use 5-6 cloves of finely minced garlic. This recipe uses 1 cup of oil so if you use minced garlic add an extra half cup of oil to the recipe to make up for the half cup I have in my scapes. I also added a teaspoon of both turmeric and ground mustard along with salt (to taste) and pepper to the garlic basil mayonnaise for flavour. Mix in 1 teaspoon of a nice Dijon mustard. You will also need to mix 2 tablespoons of freshly squeezed lemon juice to give the mayo that kick it deserves and which you would expect from a mayonnaise. I used a food processor and added all the ingredients in the processor except the oil which I streamed from the top until the mayonnaise was thick and rich looking. I removed the garlic scapes from the oil and combined that oil with the other 1 cup of oil before streaming it. You will see it takes no time at all for the 2 egg yolks and other ingredients to turn this into one amazing mayonnaise. 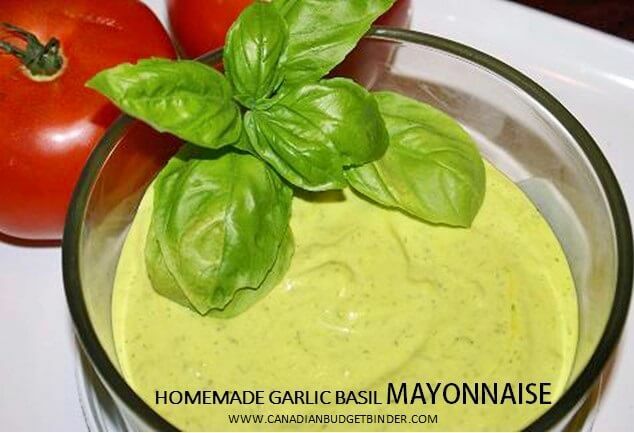 If you are a mayo lover like I am give this jazzed up Garlic Basil Mayonnaise a try. In your food processor add all of the ingredients except the oil. If you use the garlic scapes remove the oil from them and combine with the other 1 cup of oil. Turn your processor on and stream the oil through the top until the mayonnaise mixture is nice and thick. It shouldn't take too long at all. Adjust salt and pepper flavours as needed. I hope you give my Basil Garlic Mayonnaise a try and let me know what you think by leaving me a comment and recipe rating. The mayo will be perfect for your next tomato and mayo sandwich. I just made this homemade garlic basil mayonnaise. And, you know what my mom really loved it and got a copy of the recipe from me. She is planning to serve this for her friends, who are coming over this weekend. Thanks! Five stars! I made home made mayo years ago but haven’t lately. Might be a little tough to make here , no food processor or big blender here. I have an immersion unit and my mixer but that’s what I have to work with. I’m sure I could BS the recipe somehow. I have a pot of chives that I have raided for making potato and macaroni salad. I wasn’t about to pay the price for green onions so I clipped some chives and got a couple of flowers in the mix. Nobody here even noticed there was chive flower chopped up in the salads…. If you have the stick blender that would work as well. Onions and chives are dead easy to grow and ours come back every year without me planting them again lol. I’ve never thought to eat chive flowers before. Are they edible flowers then? You can eat them just fine, chives, onions and garlic are much the same family. Slows down the seeds spreading around the garden too if you eat a few of the flowers. My chives are in a large pot that goes in the garage every winter and it manages just fine.